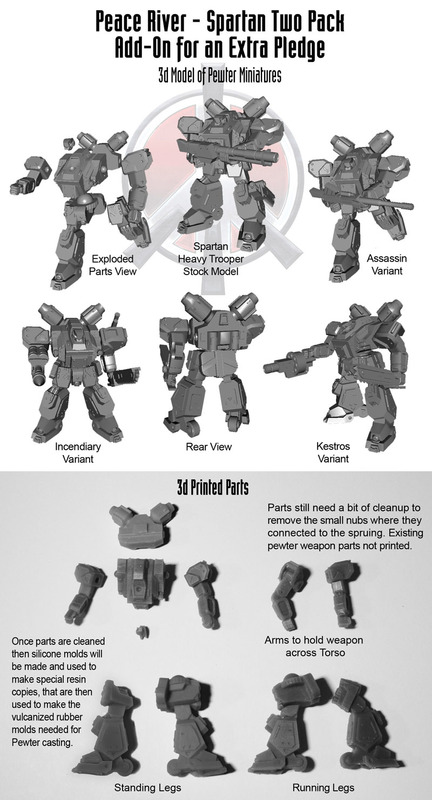 Dream Pod 9: Kickstarter Update: Peace River Spartan Two Pack 3d Printed Parts Preview! Checkout the attached image with views of the Spartan 3d model and its variants and a photo of the printed parts, made using a Formlabs 3d printer. The parts still need some cleaning to remove nubs where they were attached to the part spruing. Once the parts are cleaned up silicone molds will be made and special high temperature resistant resin parts will be cast. Those parts will then be used to make the vulcanized rubber molds for pewter casting. The Spartan Two Pack will include 1 set of standing & 1 set of running legs, 1 set of standard arms & 1 set of arms to hold the weapon across the torso, plus 2 sets of stock weapons, and 1 set of the variant weapons. Click the link below and show your support by making a pledge today for some new Peace River and NuCoal Core Plastic Miniatures and Add-Ons! Home › Blogs › Robert Dubois's blog › Kickstarter Update: Peace River Spartan Two Pack 3d Printed Parts Preview!